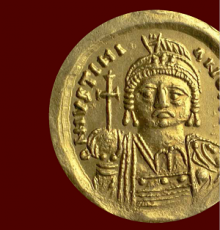 The Barber Institute is home to one of the finest collections of Roman, Byzantine, Sasanian, medieval Islamic, and medieval and modern Hungarian coins in the world, numbering around 16,000 items. 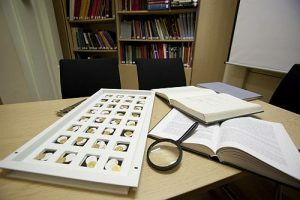 While selections from this are regularly on display in themed exhibitions in the Coin Gallery, the majority are housed in state-of-the-art storage facilities in the Coin Study Room. This room also provides access to the collection’s electronic catalogue, a specialist library containing more than 2,000 volumes and facilities for private study and seminars. If you are a researcher interested in a particular period or region for which we have holdings, please contact coins@barber.ac.uk. 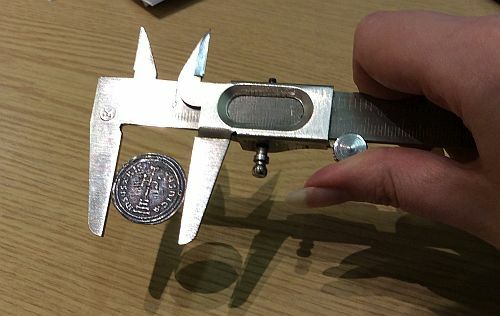 We have a library (searchable at findit.bham.ac.uk) to aid visiting researchers and measuring equipment such as scales accurate to 0.01g, and callipers available for use. High resolution images of items for publishing can be obtained at a cost of £20 plus £5 per item with a discount of 20% for more than five items. Lower resolution watermarked images can be provided free of charge. If you are a teacher, lecturer or from an historical interest group considering using the collection in education, please contact coins@barber.ac.uk. These sessions can be tailor-made to your class’s needs, so please provide at least a month’s notice and details of prior knowledge and desired learning outcomes for the most satisfactory experience. Due to gallery opening times and curatorial availability, all appointments should be confined to between 10.00 and 16.45 from Monday to Thursday. Use of the coin study room must be supervised by an appropriate member of Barber Staff (usually the coin curator himself/herself). All classes and visits external to the University of Birmingham which require viewing the physical coins must be booked in advance with the coin curator giving as much notice as possible to avoid disappointment: email coins@barber.org.uk. Anyone wishing to use the library resources or to have one of their own coins identified are advised to book in advance as the CSR may be in use for a class. All visitors are required to sign in, leaving their name, the date and time of visit, their institution or department (e.g. University of Cambridge, CAHA or private collector), the reason for the visit (e.g. 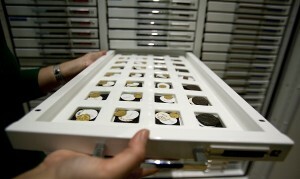 research, volunteering or coin identification), any coins viewed (noted by the curator) and whether the library is used. This is principally so that we have a record of what the room is being used for. If viewing coins, all bags and outdoor coats should be left by the sign in area, however, jackets, computers and note-taking equipment are permitted in the handling area. Only water is permitted as a consumable. 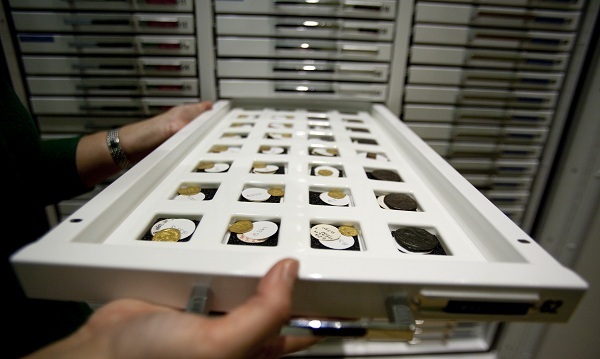 If you are visiting to see some of the coins in the collection, the curator will be the person to retrieve the items and is the person who will return them. The curator will also make a note of any trays viewed. While you are not required to wear gloves when handling the coins, we request that you wash your hands before coming to handle the coins. When handling the coins avoid, where possible, touching the face of the coin, hold by the edges instead. Visiting classes should be no larger than 10 students. Larger groups may be split into two or three sections. Photography is permitted, although use of images for publication will require the completion of an image request form, which can be obtained from the curator. The room and all cabinets are locked when not in immediate use, including when the room itself is in use. Staff and students of the University of Birmingham may borrow books from the coin library, but no more than one at a time for UGs and three at a time for PGs, this should be arranged with the curator. Groups welcome – but limited to 10 people at any one time, please!